Houston • After a first-half gimmick defense gone wrong resulted in the Jazz trailing the Rockets by 15 at halftime in Game 1 of their opening-round playoff series, they had to throw a big punch to open the third quarter and make it a game again. Which they did, rallying to within five points in less than four minutes of game time. Thing is, Houston apparently has a solid jaw — and is more than capable of throwing big haymakers of its own. After taking Utah’s best shot of the night, the Rockets responded with a 20-5 run and some intense, physical defense, blowing the game back open en route to a 122-90 victory Sunday night in the Toyota Center. Harden, a strong contender for a second straight Most Valuable Player award, dominated to the tune of a near-triple-double, racking up 29 points, 10 assists, and eight rebounds. His ability to drive the lane, draw the help defense, then find the open man in the corner all night long also paid dividends, as the Rockets amassed a big advantage in assists (25-17) and 3-pointers made (15-7). Coach Quin Snyder said after the game that the Jazz’s inability to make some small plays wound up enabling Houston to make big ones. “Really, in the first half, and some of the second, too, [it was] our inability to get a rebound when we did get a stop — particularly in the third quarter, when I thought we did start to play better,” Snyder said. “If you give a team that’s that good multiple possessions …” he added, trailing off, not needing to state the obvious conclusion. • After Utah gets within 5 points early in the third, the Rockets respond with a 20-5 run to blow the game open. • James Harden shreds Utah’s gimmick defense and totals a near-triple-double for Houston, with 29 points, 10 assists, and eight rebounds. • Rudy Gobert has 22 points and 12 rebounds for the Jazz, but is frequently left in 1-on-2 situations that result in easy Rockets baskets. The Jazz opened the game guarding Harden in a style that the Milwaukee Bucks had success with in a matchup vs. Houston down the stretch — hanging out near Harden’s left shoulder, enticing him to drive right and into the midrange. But where the Bucks trailed Harden tightly and took away crucial passing lanes, Utah’s perimeter defenders frequently fell off too soon, which too often put Defensive Player of the Year candidate Rudy Gobert in unwinnable 1-on-2 situations. Stop the penetration? Or hang back and play the lob? The NBA playoffs are here. 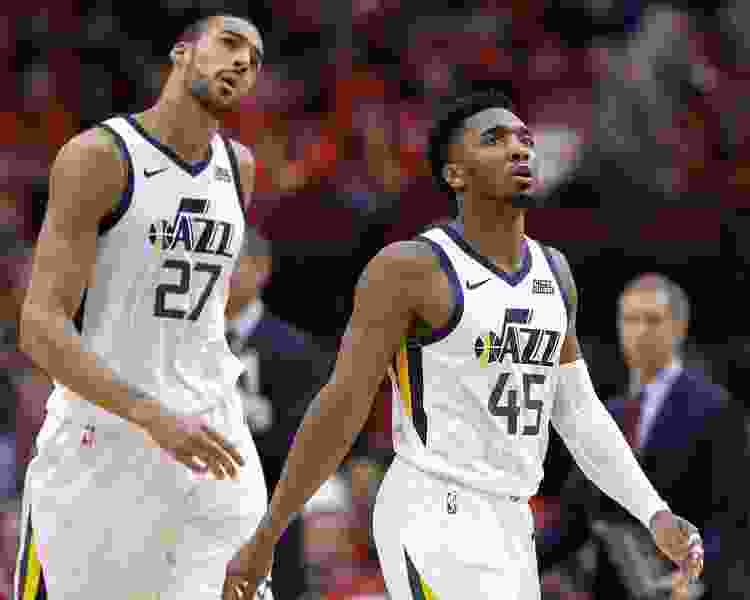 Are the Jazz ready to take the next step? Harden & Co. made the Jazz pay either way. All five Rockets starters scored in double figures, as did two bench players, as the Rockets shot 50.5% for the game. Utah, on the other hand, converted only 39% from the field, and made just 7 of 27 from deep (25.9%). Star guard Donovan Mitchell had 19 points, but shot only 7 of 18. Meanwhile, he committed five turnovers without registering a single assist — something Snyder attributed, in part, more to Mitchell’s teammates not making the right read or simply missing open looks, rather than any selfishness on the guard’s part. Big men Gobert (22 points, on 8-of-10 shooting, plus 12 rebounds) and Derrick Favors (13 points, six boards) had efficient efforts, but Joe Ingles contributed only 3 points on 1-for-4 shooting; Jae Crowder went 1 for 9; Royce O’Neale was 1 for 5; Thabo Sefolosha went 1 for 6; Kyle Korver didn’t get a field-goal attempt in 10 minutes. In the end, some of it was an incredible Houston team doing what it does — Harden making big shots, and finding Clint Capela (16 points, 12 rebounds) for lobs, and hitting Eric Gordon (17 points, 3-for-5 3-point shooting) in the corner. And some of it was self-inflicted on Utah’s part — allowing eight offensive rebounds and 13 second-chance points, committing 19 turnovers that yielded 24 points for the Rockets. Either way, with Game 2 of the best-of-seven series Wednesday night, Snyder is looking for improvement all the way around. The Jazz had a big run early in the third to crawl within five points, but the Rockets responded with a 20-5 run. 15 • Houston’s big advantage, not surprisingly, came beyond the 3-point arc, where the Rockets drained 15 triples to Utah’s seven. Game 2 of the first-round series will come Wednesday night at the Toyota Center.